Infinite Arts is offering a practical workshop in Geodesic Dome building. This half day or full day session can be designed for a Y5, Y6, Y7 or Y8 class (up to 30 pupils at a time). • Roll newspaper into strong struts for dome building. This workshop will take place in school preferably in a hall or very large room. It’s not a messy activity – just paper and sticky tape. It can usually be accommodated in a 3 hour half-day session. A full day session could cover the same activity with two separate groups or could go into greater detail with one group over a full day. 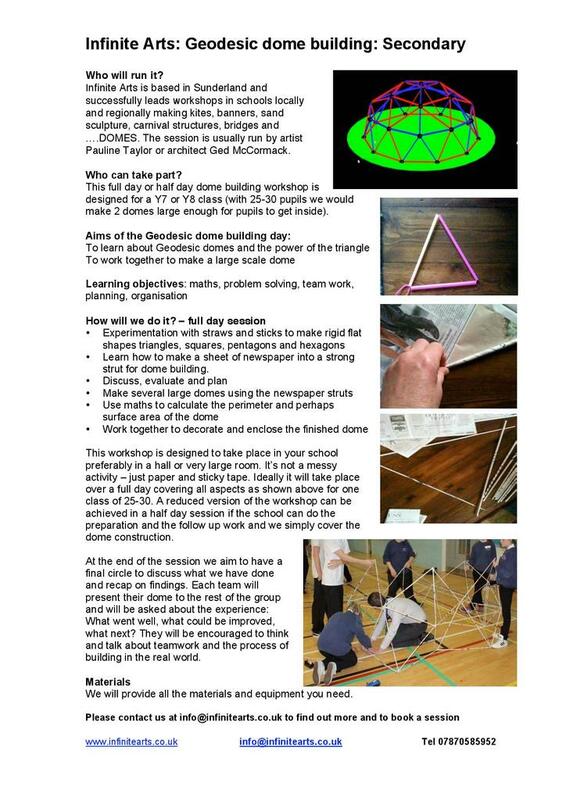 Within one class of 30 pupils we usually split nto two teams and make two domes. At the end of the session we recap on findings from the work. Each team presents their dome to the rest of the group and is asked about the experience: what went well, what could be improved, what next? They will be encouraged to think and talk about team work and the process of engineering and building in the real world. We will provide all the materials and equipment you need.